Gifting is not always easy for most people. This is especially true during holiday seasons. Hence, gift cards are becoming more popular as they solve this problem effectively. However, creating gift vouchers to sell on a Magento store is not simple. As a provider of e-commerce software, we frequently have to answer questions regarding the configuration of the Gift Card module. Most of our customers are newbie/rookie and there is no understanding of the techniques in Magento for configuring this tool. So, it is difficult for them to manage this module well. Hence, in this article, we will guide you to setup this module as well as give you some small tips so that you can customize the Gift Card without requiring any code skills. How to change the logo on the email template? Then, go to line 25 and replace the current logo image’s name with the new one. How to translate the displayed language? Mageplaza Gift Card uses English as the default language. If your customers speak another language, take the following steps to translate the language that is applied in Gift Card extension. Step 2: Move this file to the folder: app/locale/your_language/Magestore_Giftvoucher.csv Then, translate the language in this file into the languages as you want. Step 3: Refresh Cache in the backend. How to change position of Gift Card in checkout page? Keep in mind to clear cache after any changes you made on your Gift Card folder; then they will be shown as you desire. Mageplaza developed a fantastic module that offers great opportunities for customers in choosing gifts for their loved ones. Besides that, it also creates attractive opportunities for store owners to increase their sales significantly. This module is Mageplaza Gift Card. This tool not only helps shop owners improve the brand, but also brings the high revenues. More specifically, you can help customers deal with this frustration. 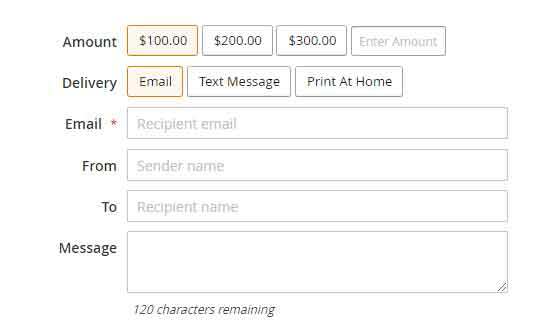 Personalize Gift Cards: By using the user’s photos as templates, they can personalize their gift vouchers. Drag and drop to design: This feature enables admins to drag and drop blocks easily from the backend. Delivery methods: Purchasers are allowed to send gift vouchers by SMS, emails or via online messengers. Delivery time: Purchasers can choose specific time and date when delivering their gift cards. Gift Card History: Creating, sending, receiving, and redeeming the gift card included in Gift Card’s history will be followed in the backend. 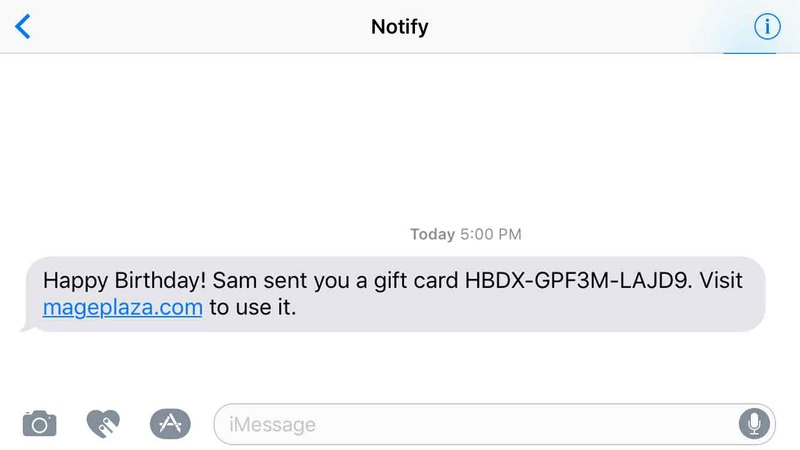 SMS Notification: Enable store admins to send SMS to the recipients about card’s status. Discount Options: Thanks to this feature, admins can set the discount on the product’s price. Expirations Dates: You can set expiration dates for the gift certificates from the backend.